1973-05-07. New. Ships with Tracking Number! INTERNATIONAL WORLDWIDE Shipping available. Buy with confidence, excellent customer service! 1973-05-07. Good. Ships with Tracking Number! INTERNATIONAL WORLDWIDE Shipping available. May not contain Access Codes or Supplements. May be ex-library. Shipping & Handling by region. Buy with confidence, excellent customer service! Routledge. Hardcover. 0415083842 Brand New, printed in english , Ready to ship, fast delivery (6-8 busienss days ) worldwide . New. Routledge. Used - Very Good. Ships from the UK. Former Library book. Great condition for a used book! Minimal wear. 100% Money Back Guarantee. Your purchase also supports literacy charities. London: Routledge & Kegan Paul, 1973 Book is Volume 2 of the Collected Works of C.G. Jung, edited by Sir Herbert Read, Michael Fordham, Gerhard Adler and William McGuire. Translated by Leopold Stein in collaboration with Diana Riviere. After joining the staff of the Burgholzli Mental Hospital in 1900, Jung developed and applied the word-association tests for studying normal and abnormal psychology. 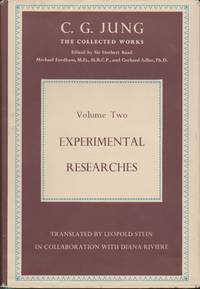 Between 1904 and 1907 he published nine studies on the tests. These studies, together with two lectures, compose this volume. Blue cloth gilt titling, occasional charts & graphs, 649 pages. Text block edges have some minor discolouration, owner's name in ink on end paper, Dust jacket, which is clipped, has light edge wear, spine very lightly sunned. This is a handsome book, in nice condition. Shipping charges are calculated for a standard parcel under 1 kg. Additional charges will apply for heavier shipments, but not until the customer agrees. Canadian customers, please note that applicable sales taxes will be added. Please contact us with any questions you might have. Hard Cover. Very Good-/Good+. 8vo - over 7¾" - 9¾" tall. Princeton University Press. Used - Good. A sound copy with only light wear. Overall a solid copy at a great price! some highlighting All orders guaranteed and ship within 24 hours. Your purchase supports More Than Words, a nonprofit job training program for youth, empowering youth to take charge of their lives by taking charge of a business.